Need to use your streams over and over again? Let's cover three different approaches, their benefits, and their pitfalls when recycling Java streams. Although Java streams were designed to be operated only once, programmers still ask how to reuse a stream. From a simple web search, we can find many posts with this same issue asked in many different ways: "Is there any way to reuse a Stream in java 8? ", "Copy a stream to avoid stream has already been operated upon or closed", "Java 8 Stream IllegalStateException", and others. Store the intermediate result into a collection. Yet, both options have drawbacks and none of them is best suited for all use cases. Using the first approach, what happens if data comes across the network, or from a file or database, or other external source? In this case, we must return to the data source again, which may have more overhead than storing the intermediate result into a collection. So, for multiple traversals on immutable data, maybe the second solution is more advantageous. Yet, if we are only going to use the data once, then we get an efficiency issue using this approach, because we did not have to store the data source in memory. Memoizing the entire stream into a collection to avoid multiple roundtrips to data source. Memoizing and replaying items on demand into and from an internal buffer. In order to understand all details of this article you must be familiarized with streams terminology. To highlight the drawbacks of alternative approaches of reusing Java streams, we will present a use case based on an HTTP request. To that end, we will use the World Weather online API to get a sequence of items with weather information in a CSV data format. Particularly, we are interested in a sequence of temperatures in degrees Celsius in March at Lisbon, Portugal. So we must perform an HTTP GET request to the URI http://api.worldweatheronline.com/premium/v1/past-weather.ashx with the query parameters q=37.017,-7.933 corresponding to Lisbon's coordinates, date=2018-03-01&enddate=2018-03-31 defining the date interval, tp=24 to get data in 24 hour periods, format=csv to specify the data format, and finally key= with the API key. Ignore lines starting with #, which correspond to comments. Extract the third value corresponding to a temperature in Celsius. Convert it to an integer. Now, whenever we want to perform a query we may get the resulting stream from the CompletableFuture. In the following example, we are getting the maximum temperature in March and counting how many days reached this temperature. if you need to traverse the same data source again, you must return to the data source to get a new stream. However, this technique forces the re-creation of the whole pipeline to the data source, which incurs inevitable IO due to the HTTP request. Since data from past weather information is immutable, then this HTTP request is useless because we will always get the same sequence of temperatures. To avoid useless accesses to the data source, we may first dump the stream elements into an auxiliary collection (e.g. List<T> list = data.collect(Collectors.toList())) and then get a new Stream from the resulting collection whenever we want to operate that sequence (e.g. list.stream().filter(…).map(…)….). With this CompletableFuture<List<Integer>>, we can build a Supplier<Stream<Integer>> that returns a new stream from the list contained in the CompletableFuture. Now, when we ask for a new stream to lisbonTempsInMarch, instead of chaining a stream pipeline to the data source (approach 1), we will get a fresh stream from the auxiliary list contained in mem that collected the intermediate sequence of temperatures. Yet, this approach incurs in an additional traversal to first collect the stream items. We are wasting one traversal, which is not used to operate the stream elements (i.e. strm.boxed().collect(toList())) and then we incur in a second traversal to query that sequence (i.e. lisbonTempsInMarch.get().max(Integer::compare).get()). If we are only going to use the data once, then we get a huge efficiency issue, because we did not have to store it in memory. Moreover, we are also wasting powerful "loop fusion" optimizations offered by streams, which let data flow through the whole pipeline efficiently from the data source to the terminal operation. 1, 0, 4, 6, 0, 6, 6, 3, 1, 2, Nrs wraped in a CF and transformed in CF<List>! Note that when the resulting stream (i.e. 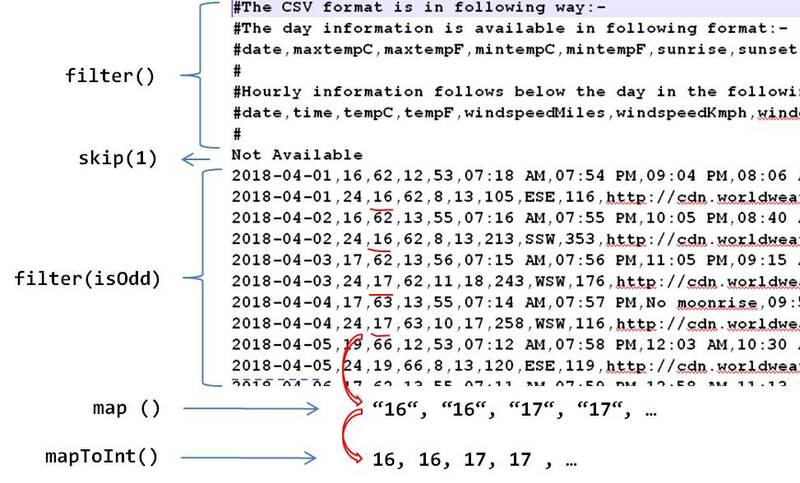 nrsSource.get()) is traversed by the max() operation, the stream from data source nrs has already been computed by the collect() operation resulting in the output: 1, 0, 4, 6, 0, 6, 6, 3, 1, 2,. So, instead of executing just 2 traversals to compute 2 queries, the maximum value and the number of occurrences of the maximum value; we are performing one more traversal first that is not used in any of the end queries. Yet, this solution does not allow concurrent iterations on a stream resulting from the concatenation while the source has not been entirely consumed. When the stream from the source accesses a new item and adds it to the mem list, it will invalidate any iterator in progress on this list. Consider the following example, where we get two iterators from a stream of integers memoized with the memoize() method. We get two items (i.e. 1 and 2) from the first stream (iter1), and then we get a second stream (iter2), which is composed by one stream with the previous two items (i.e. 1 and 2) and another stream from the source. After that, we get the third item from the first stream (iter1), which is added to the internal mem and thus invalidates the internal stream of iter2. So when we get an item of iter2, we get a ConcurrentModificationException. // from an internal mem replay Recorder. // If it is in mem then just get if from the corresponding index. For each data source, we have a single instance of Recorder and one instance of MemoizeIter per stream created by the supplier. Since the getOrAdvance() of Recorder may be invoked by different instances of MemoizeIter, then we made this method synchronized to guarantee that just one resulting stream will get a new item from the source iterator. This implementation solves the requirement of concurrent iterations on the same data source. But to solve this problem is not mandatory that the second stream others be fully collected into an intermediate collection. Although we need to traverse others multiple times, there are some cases where we do not need to traverse it to the end. Considering that all items from stream nrs always match an item at the beginning of the stream others, then we do not need to store all items of others in an intermediate collection. The final solution and source code for Replayer is available at Github repository javasync/streamemo. We also provide the streamemo library with the class Replayer at Maven Central Repository, which you can include in your project adding its dependency. Reactive Streams implementations, such as RxJava or Reactor, provide similar feature to that one proposed in third approach. Thus, if using Stream is not a requirement, then with Reactor Core, we can simply convert the Supplier<Stream<T>> to a Flux<T>, which already provides the utility cache() method and then use Flux<T> operations rather than Stream<T> operations. Due to the asynchronous nature of Flux, the result of a terminal operation such as reduce() or count also produce an asynchronous result in an instance of Mono (i.e. the reactor equivalent to CompletableFuture), which can be followed up later through the subscribe() method.